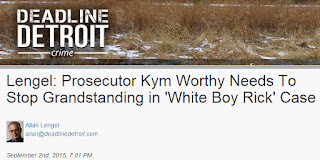 Detroit media coverage of the story of Richard Wershe, Jr., better known to the public as White Boy Rick thanks to relentless media use of that nickname, has been deplorable, shoddy and often wrong for close to 30 years. The inexcusable erroneous reporting calling him a “drug lord” and “kingpin” is one of the reasons Wershe has been in prison since age 18. Detroit's news media owes it to this man to finally tell his story correctly. Mark Twain said never pick a fight with someone who buys ink by the barrel. My intent in this blog post isn’t to pick a fight with old reporter friends, newbie journalists or former competitors in the Detroit media. Everyone makes mistakes, including reporters, including editors, including me. I’ve made my share so this isn’t about casting stones in a glass house. The purpose of this blog post isn’t to hold any individual reporter up for ridicule. of sensationalized, distorted and in many cases just plain wrong reporting has contributed to the deprivation of liberty for Richard J. Wershe, Jr. for almost three decades . Any reporter or editor currently covering the Rick Wershe story and working for a Detroit media outlet that was peddling news and information in 1987 has an ethical obligation to try to make up for some deplorable journalistic sins of the past. It will take some hard reporting and a lot of skepticism about the prosecution claims over the years about Wershe. This past Friday I spoke with Rick Wershe by phone from Oaks Correctional Facility, where he is serving a life sentence for a non-violent drug crime. I asked him how the inaccurate media reporting over the years has affected him. It’s time for reporters covering the Rick Wershe story to take an open-minded look at the other side of the story and report it. Many people who are following the saga of Rick Wershe express frustration about the news coverage in comments on the Free Richard Wershe Jr. Facebook page. At the end of this blog I’ll tell you who to complain to about the coverage. Letters and phone calls may finally prod Detroit news organizations to get this story right, or at least not report falsehoods as facts. One of the reasons the media coverage of Rick Wershe, Jr. is important is because judges and parole board members are influenced to varying degrees by what they see on TV and read in the papers. Anyone who argues otherwise is a naive fool. Media coverage becomes the prevailing wisdom about many things. If the media describe something in a certain way over and over for years, it becomes accepted wisdom and accepted truth. This post is about the need for various news organizations to do a story correction as a group and offer an apology as a group for helping ruin a man’s life. There is a need—now—for accurate and balanced reporting on Richard Wershe, Jr. as opposed to meekly assuming the prosecution is the only side telling the truth. Anyone who reviews the media coverage for the past 28 years for the man they like to call White Boy Rick will see a bias toward a corrosive and reputation-destroying description of this man as a major figure in the Detroit drug underworld. It is a ceaseless media portrayal that is not supported by facts. Before we examine some specific examples of the media coverage of Rick Wershe let’s review a few important facts. Wershe did not become a dope dealer and then turn informant as has been reported far too often. He was recruited—at age 14—by the FBI to help them investigate and prosecute the Johnny Curry drug gang. Wershe had no involvement with drugs until law enforcement asked him to infiltrate that dangerous business so they could make a case. This has been verified, on the record, by several retired FBI agents. Any media story calling him a dope-dealer-turned-informant is wrong and exactly backwards. Wershe turned to drug dealing when the Detroit federal drug task force abandoned him after they introduced him to the drug underworld in order to make a big case. After they no longer needed his help, they kicked this teen to the curb to fend for himself after teaching him how to live the life of a dope dealer. Despite the endless media coverage calling him a “drug lord” and drug “kingpin” Richard J. Wershe, Jr. was tried and convicted as an individual. Specifically he was found guilty of “Possession with intent to deliver over 650 grams of cocaine.” Nothing else. Wershe sentencing document showing he was convicted of Possession with Intent to Deliver Cocaine and not conspiracy or racketeering. 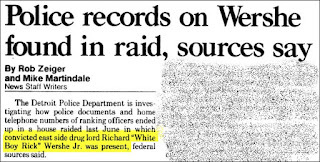 There is nothing in the court records at the state and federal level—NOTHING—charging Wershe with conspiracy or racketeering, the crimes essential to being a “drug lord” or “kingpin.” The prosecution did not take down Rick Wershe and his “co-conspirators” because he had no co-conspirators. It was just him, trying to make it in an illegal trade he was taught by law enforcement personnel. They picked him for the job because he happened to know some guys they wanted to bust. As veteran criminal defense attorney Steve Fishman has noted in interviews, Wershe’s name never came up in any way in the major drug gang trials of that era. Fishman knows because he was defense counsel in many of those trials. Current reporters struggling with what to make of Wershe should interview Fishman. When I filed a formal Freedom of Information Act request asking the Wayne County Prosecutor’s Office for any records or documentation supporting the allegation that Wershe had a drug gang, the official response was, “after a diligent search we certify the records do not exist.” They didn’t say the records were purged or misplaced. They said the records do not exist. Yet Detroit’s newspapers and TV stations have routinely described Rick Wershe as a “drug lord” or “kingpin” for close to 30 years. How could this happen? How could so many “journalists” get it so wrong for so long? Reporters in Detroit and elsewhere need to recognize and come to terms with an unpleasant truth: they have been duped for nearly 30 years with a law enforcement Big Lie about the adolescent-now-man they persist in calling White Boy Rick. His real name is Richard John Wershe, Jr. and the media perpetuation of the White Boy Rick legend—a Big Lie—has cost him his life. The news media bear a lot of the responsibility for the violation of Rick Wershe’s Eighth Amendment rights regarding cruel and unusual punishment. Reporters, editors and TV news directors have consistently failed to fact-check, to find the hard-fact basis for routinely describing this man in news coverage as a “drug lord” and “kingpin.” It is journalistic irresponsibility at its worst. For those who do not know, the Big Lie is a concept developed by the German dictator Adolph Hitler. “If you tell a big enough lie and tell it frequently enough, it will be believed,” Hitler said. As part of his propaganda philosophy Hitler believed if you tell a lie of colossal proportions and repeat it often, people will assume no one would have the audacity to distort the truth to such a degree so it must be true. 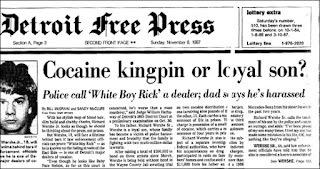 The urban myth that White Boy Rick Wershe was a drug dealer operating at the “kingpin” level in Detroit is a Big Lie repeated often, without question, by several generations of reporters and editors based on—nothing. The decades-long failure of numerous reporters to verify the truth or falsity of claims that Richard J. Wershe, Jr., who is white, was a teenage “drug lord” on the mean streets of mostly-black Detroit when he was between the ages of 16 and 18 is journalistic dereliction of duty of historic proportions. The overblown claims about Rick Wershe’s importance in the Detroit drug underworld don’t pass the smell test. J schools (journalism schools at universities) could offer courses on how shoddy fact-checking and the herd journalism habit of re-writing each other’s stories in the coverage of Rick Wershe aided and abetted what appears to be an audacious vendetta to keep this man in prison until he dies because he helped the FBI investigate and prosecute drug-tainted political corruption in Detroit. The notion that certain police officers, prosecutors and perhaps some members of the Michigan Parole Board conspired to destroy one man as retribution for exposing high-level, politically-connected drug corruption defies belief. So reporters have refused to investigate it, preferring instead to destroy the man they relish calling White Boy Rick. The usual sources said it’s true, so it must be true. There has been a decades-long assumption by reporters that the police and prosecutors are telling the truth about Richard Wershe. Assuming the “good guys” are telling the truth is a dangerous state of mind for ethical, professional reporters. Any reporter worthy of the title need only look at the Richard Jewell case to see the shameful coverage of Rick Wershe isn’t the first instance of large-scale malfeasance by a journalistic herd in America that swallowed whole a questionable story line put out by law enforcement. Richard Jewell was a security guard working at the 1996 Atlanta Summer Olympics. He came upon a backpack filled with three pipe bombs. He alerted the police and helped evacuate the area. At first he was hailed as a hero, but then reporters began reporting leaks from anonymous police sources that Jewell was suspected of planting the pipe bombs himself. What followed was a journalistic stampede to crucify Richard Jewell in the papers and on TV. There was just one problem. It wasn’t true. None of the “reporting” about Richard Jewell was supported by facts. Jewell’s reputation was thoroughly trashed and his life was ruined by the media coverage. Jewell was dragged through the journalistic mud from coast to coast. 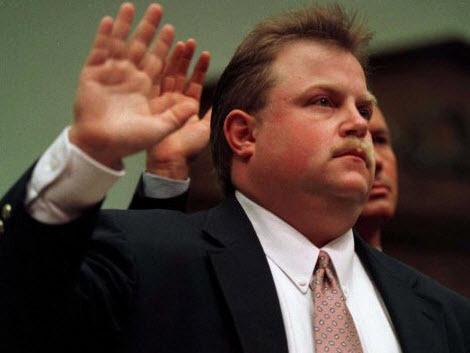 In the end, Richard Jewell was completely exonerated. A man named Eric Robert Rudolph was eventually charged and convicted of planting the bombs at Atlanta’s Olympic Park. Rudolph was sentenced to four consecutive life sentences as a domestic terrorist. The ordeal of Richard J. Wershe, Jr. is as bad, perhaps worse, than what happened to Richard Jewell. The trashing of Richard Jewell lasted several months. The trashing of Richard Wershe Jr. has lasted nearly 30 years. Wershe has been in prison 27 years on the presumption he is a menace to society. When he was up for his one and only parole hearing in 2003, the Wayne County Prosecutor’s Office argued strenuously against his release. Their evidence he was a menace to society? A stack of press clippings about him. Wershe’s story is tainted by the fact he is not innocent. He did try to become a major illegal drug wholesaler. But he failed. He never came close to being a cocaine kingpin even though he’s been described that way by some in the law enforcement community in what appears to be retribution for telling on dirty cops. With a few exceptions most of the Detroit news media have ignored the evidence I have presented on Informant America every week for over six months. I have used the Freedom of Information Act, the archive documents of various lawyers and courts and on-the-record interviews to prove the White Boy Rick legend doesn’t hold up to hard reporting scrutiny. None of these blog posts are based on anonymous or confidential sources. Even if a reporter or editor chooses to dismiss me as an over-the-hill malcontent, a curmudgeon, a crank, that doesn’t change the facts—or lack of them—in the false claim that Rick Wershe was a teen drug dealer operating on such a massive scale that he must be kept behind bars for the rest of his life. Four retired FBI agents who worked with Wershe as an informant—count ‘em; four—have said on the record that Richard Wershe Jr. has been instrumental in helping fight drug trafficking and public corruption—even from prison. And they challenge the notion that Rick Wershe was a kingpin. All four of these agents, Gregg Schwarz, Herman Groman, Martin Torgler and Michael Castro have said they are willing to testify in court or before the Michigan Parole Board in Wershe’s behalf if asked to do so. Schwarz, Groman and Torgler did just that at Wershe’s 2003 parole hearing. Castro, who worked undercover in a major police drug corruption sting operation, says he owes his life to Rick Wershe who vouched for him when he was undercover playing the role of a Miami drug figure. Readers of this blog must realize it’s a difficult thing for reporters to admit they are wrong; that they have reported lies as facts. Imagine how hard it is for the Detroit Free Press, the Detroit News, the Oakland Press and Channels 2, 4 and 7 to admit they have been reporting—for nearly 30 years—unverified information that may be false. Add the fact that the Rick Wershe story is very complicated, with a cast of hundreds and a time frame measured in the decades and most reporters would be inclined to shrug it off and just keep repeating the same libel, figuring no one will notice or care. One of the fundamentals of good reporting is fact checking. If it had truly been done in the coverage of Richard Wershe, Jr. the story would be considerably different. It is disheartening to look at some of the Detroit media coverage of Rick Wershe over the years but we will do it, anyway. Many stories have been published and countless stories have been aired in Detroit about this one defendant/inmate. To follow are just a few examples out of many. Before we look at the coverage, here’s the first piece of fiction about Wershe. He was never known on the streets as White Boy Rick. The drug underworld knew him simply as Ricky, a white kid who was running with a black drug dealer named Johnny Curry who was convicted and sentenced to federal prison. He’s now out. Arthur “Art” Derrick, now deceased, was a self-admitted major Detroit drug wholesaler with a small fleet of planes used to transport cocaine. Before he died from drug abuse Derrick claimed under oath in a deposition that he is the one who gave Rick Wershe the nickname White Boy Rick to avoid confusion with another customer also named Rick, who was black. Derrick claims he nicknamed the late Rick Carter “Maserati Rick” for the type of car he drove. Maserati Rick, a black drug dealer, was murdered in his hospital bed while recovering from a previous murder attempt. He was buried in a casket made to resemble a Mercedes Benz. Narcs heard the White Boy Rick nickname from Derrick and loved it. They shared it with WXYZ-TV crime beat reporter Chris Hansen who introduced it to the public in the final installment of a high-profile, highly viewed series of reports in July of 1987 about a police investigation of the Chambers Brothers who arguably ran the biggest volume cocaine operation in Detroit history. The final segment of the five-part series introduced viewers to a young man Hansen called White Boy Rick. To develop the series Hansen and a Channel 7 cameraman were embedded with a team of Detroit Police and DEA narcs who liked to call themselves the No Crack Crew. Some say Hansen was more than embedded with the narc crew; they argue he was figuratively in bed with the narcs with no daylight between the views of the No Crack Crew and what Hansen reported on TV. In exchange for hot drug raid footage some say Hansen became an unquestioning PR mouthpiece for a team of glory-hungry cops. Hansen’s competitors didn’t care. When they saw Hansen’s report about a white teenager who was a drug lord among ruthless adult black dope dealers, they went bonkers. Newspaper headline writers had a field day. 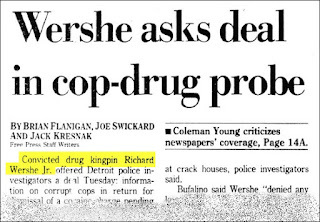 Detroit newspapers seldom missed an opportunity to attach the terms "kingpin" and "drug lord" to Rick Wershe's name. When Hansen jumped from Channel 7 to Channel 4 in Detroit he continued to exploit the White Boy Rick legend he helped launch. Hansen suggested to Rick Wershe that he do an interview with him about police drug corruption. Detroit FBI agent John Anthony, now retired, urged Wershe not to do it. Wershe didn’t listen. He did the interview and it spooked a lot of corrupt cops and Detroit politicians into thinking Wershe knew more than had been reported. All these years later Wershe realizes that interview may have contributed to the start of a vendetta against him. Today Wershe says he never knew as much about the spider’s web of drug dealing, police corruption and city politics as many people think he knows. Theoretically in the American system of justice a person is presumed innocent until proven guilty. Reporters give a slight bow to this concept by using the words “alleged” and “reputed” when accusing someone of a crime in their coverage. Not so with Richard J. Wershe, Jr. Those qualifiers often fell by the wayside. In other cases, the reporters only got it half-right. In the examples to follow the bold text has been added to make various points. Consider a story from the Detroit Free Press on May 11, 1988. The headline reads, ‘Wershe asks deal in cop-drug probe’ The front page story begins this way: “Convicted drug kingpin Richard Wershe Jr. offered Detroit police investigators a deal Tuesday: information on corrupt cops in return for dismissal of a cocaine charge pending against him.” The story was written by Brian Flanigan, Joe Swickard and Jack Kresnak. All three were top-notch reporters, some of the best in Free Press history. Yet their lead sentence calls Wershe a convicted drug kingpin. Consider this Page One piece from the Detroit News a day later; May 12, 1988. 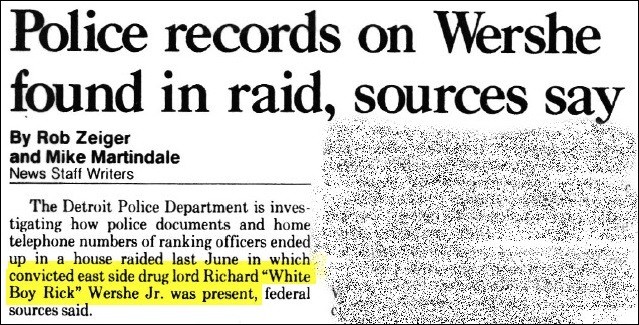 The headline reads: ‘Police records on Wershe found in raid, sources say.’ The lead of the story begins, "The Detroit Police Department is investigating how police documents and home telephone numbers of ranking officers ended up in a house raided last June in which convicted east side drug lord Richard "White Boy Rick" Wershe Jr. was present, federal sources said." Let’s go back and look at these stories from a different perspective. Each is about what Rick Wershe may or may not know about police drug corruption. That’s a potential story lead about public corruption if ever there was one. I can’t show you the enterprise reporting that sprang from these two stories because as far as I can determine, it does not exist. 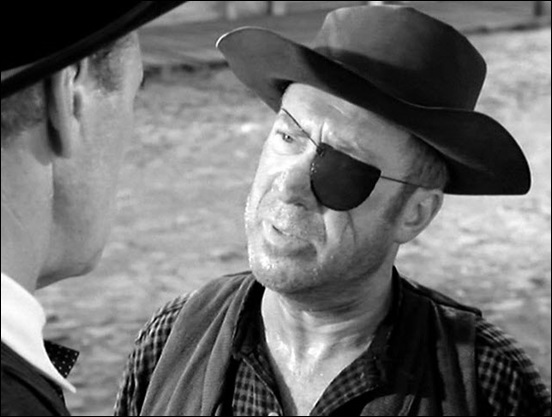 Richard Wershe Senior AND Junior tried to tell reporters they both had been paid informants of the FBI. The Free Press and Detroit News reported what the Wershes said but apparently didn’t believe it after the Detroit FBI made the usual “no comment.” The FBI by policy does not talk about its informants but that didn’t mean they were denying what the Wershes said. They merely refused to comment. It’s not the same thing. Subsequently, retired FBI agents have verified on the record that it was true. Let’s connect some dots in the coverage from 1988 to now. The Detroit Police knew Rick Wershe was a paid FBI informant because two Detroit police officers worked closely with Wershe. They were assigned to a federal drug task force that was using the teen as an informant. When Rick Wershe, Jr. started making headlines there are indications based on items found in a police raid that he knew some things about police drug corruption in Detroit. It was the Detroit Police who arrested and charged Wershe with the help of the Wayne County Prosecutor. The Detroit Police and Wayne County Prosecutor’s Office were the ones who leaked the “news” that White Boy Rick was a cocaine kingpin even though he was never charged with operating a cocaine conspiracy. 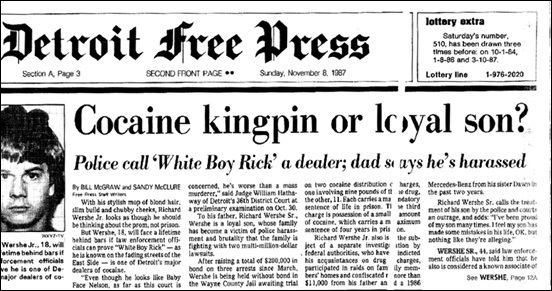 No one was ever prosecuted at the state or federal level as a member of a White Boy Rick drug ring. 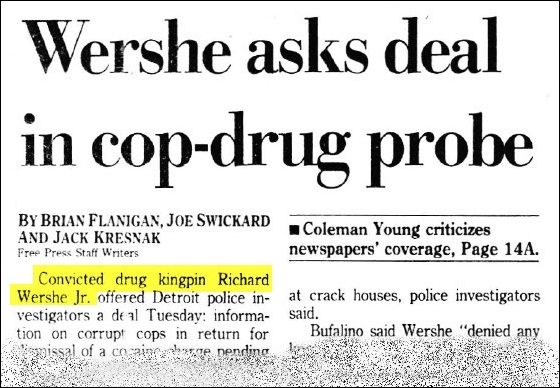 From 1987 to this day, Detroit news media outlets have persisted in describing Rick Wershe as a “drug lord” and “kingpin” without any court records or verifiable evidence showing it is true. Rick Wershe’s one and only parole board hearing was under-reported by the media. It was all on the record and transcribed by a stenographer. The record is teeming with issues begging to be explored, with provocative questions as yet unanswered. Three FBI agents testified for Wershe’s parole. Two DEA agents testified against it. One DEA agent’s “evidence” against Wershe was weak, to put it mildly. None of the Detroit Police narcs who arrested Rick Wershe testified. Detroit Police executives who admitted no personal knowledge of the man up for parole testified in generalities that crime is bad. The Wayne County Prosecutor’s documentation in support of keeping Wershe in prison consisted of newspaper clippings and numerous suburban police reports of domestic disputes between Richard Wershe, Sr. and Rick Wershe’s sister, Dawn. The prosecutor’s office did not offer any evidence or documentation to support the notion that Rick Wershe is a danger to the community. This provocative comment apparently did not stir any interest, any curiosity in Detroit’s reporters. Since both men are deceased we will never know. According to the hearing sign-in sheet, one of those in attendance was WDIV-TV, Channel 4 reporter Kevin Dietz who filled Chris Hansen’s role at the station when Hansen moved on to NBC Dateline. Channel 4 is Detroit’s NBC affiliate. Last winter, beginning with the night of the Super Bowl on NBC, Dietz renewed his coverage of the Rick Wershe Jr. story. His reporting on Wershe came on the heels of reports in the Hollywood trade press of interest in doing a movie about White Boy Rick. It’s not clear why it took Dietz 12 years to resume his coverage of the plight of Michigan prison inmate 192034—Richard J. Wershe, Jr.
Perhaps Hollywood’s interest reminded him Wershe was still in prison. But at least Dietz started stirring the pot about the inmate languishing behind bars, serving a life sentence. That’s more than his competitors have done until the current re-sentencing issue bubbled to the surface. WJBK-TV Channel 2, the Fox affiliate in Detroit, jumped on the story with inaccurate reporting, as so many others have done. Their Web site story about Wershe’s possible re-sentencing featured this headline: "Drug dealer turned informer 'White Boy Rick' up for resentencing"
This is wrong. It is exactly backwards. Wershe was an informer first and became a drug dealer later. There is a significant difference. The inversion of facts changes the story entirely. Charlie Langton, a so-called legal analyst on Fox 2, seems to delight in calling Wershe a drug lord and kingpin. He uses the terms as often as possible when questioning guests who may know something about the case. His knowledge of the case is clearly negligible. I tried to contact Kevin Roseborough, the Fox 2 news director and a former colleague about all of this. He didn’t return my phone call. I reached out to anchor Huel Perkins through a business social media site. He didn’t respond. Unlike the newspapers most of the TV stations make it difficult to reach any of the staff by email. WXYZ-TV Channel 7, the ABC affiliate in Detroit, has escaped criticism by essentially not reporting or barely mentioning the latest developments in a story they broke in 1987. The station has purged most of the staff that was around when White Boy Rick was front page news. The current court-beat reporters for the Detroit Free Press and Detroit News seem to be trying to do a better job with the story, but they are struggling to get it right. 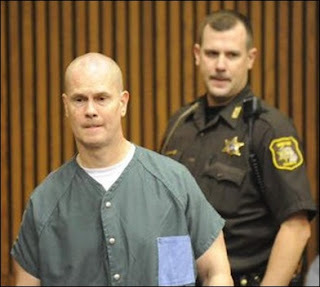 "Richard Wershe Jr., a convicted drug dealer and former police informant known as White Boy Rick, is scheduled to appear in a Detroit courtroom Friday morning." sound like Wershe became an informant to save his own skin. Not true. As noted on Informant America many times, Wershe was recruited by law enforcement to get involved in the drug trade at age 14 because of neighbors he knew who were targets of investigation. That is a huge contrast to suggesting that a kid became a dope dealer and then became an informant. One Detroit journalist, a former reporter for the Detroit News and Washington Post, has been getting it right on a news Web site called Deadline Detroit. Allan Lengel has been writing stories for several years about the plight of White Boy Rick Wershe. Lengel, alone among the rest of Detroit’s reporters, has a solid grasp of what’s happening in this case. "White Boy Rick: Time to Set Him Free?" was the headline on a story Lengel wrote in 2012. "The Michigan Parole Board's Crime Against 'White Boy Rick'" was the headline on another story Lengel wrote in September of 2013, two years before the current court battle over re-sentencing Wershe. To keep Wershe locked up is “gravely unjust for someone convicted as a teen,” Lengel wrote. This is essentially what Wayne County Circuit Court judge Dana M. Hathaway is now arguing two years later in her effort to re-sentence Wershe to time served. 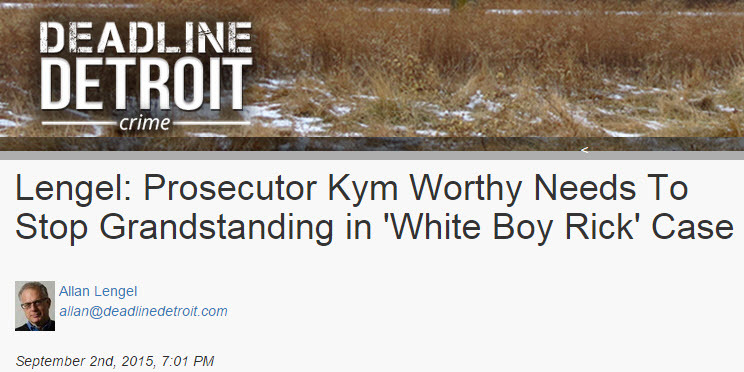 Earlier this month a Lengel story on Deadline Detroit on Wershe was headlined: "Prosecutor Kym Worthy Needs To Stop Grandstanding in 'White Boy Rick' Case"
Another reporter/blogger in a category by himself is Scott Burnstein who writes for the Oakland Press and has a blog called Gangster Report. Burnstein has been writing about Wershe for a long time and he regards himself as in Wershe’s corner. His reporting in the Oakland Press has been more balanced than most, but on his blog he can’t resist linking Wershe to the gangster underworld since that is what his blog is about. The part about Mayor Coleman Young’s niece is true but notice he couldn’t resist calling Wershe a “teenage drug lord” and described his “ascent in the murderous Motor City underworld.” This unfairly implies Wershe was somehow involved in drug-related murders. He was not. William Rice, the former head of Detroit Homicide who is himself now serving a prison term (more police corruption) signed a sworn affidavit stating he never heard of Rick Wershe in his 20 years investigating Detroit murders. Moreover, Wershe was never charged with any drug-related violence. There may be too much pride and ego on the line to expect the Detroit news media to admit they’ve been wrong about Richard Wershe, Jr. for nearly 30 years. But from this point forward there’s no excuse for the sloppy journalism to continue. There’s no reason to keep unjustly libeling a man as a "drug lord" and "kingpin" villain. If you see any coverage where Rick Wershe is called a “drug lord” or “kingpin” or “drug dealer turned informant” you are encouraged to reach out and raise hell about it. The sorry state of reporting on Richard J. Wershe, Jr. spanning decades calls to mind a scene from the classic Western High Noon. Kane: What’s the matter Jimmy? Jimmy: Nothin’. I been lookin’ for ya. I want a gun. I wanna be with you when the train comes in. Kane: Can you handle a gun? Jimmy: Sure I can. I used to be good. Honest." The Detroit news media used to be good. Honest.